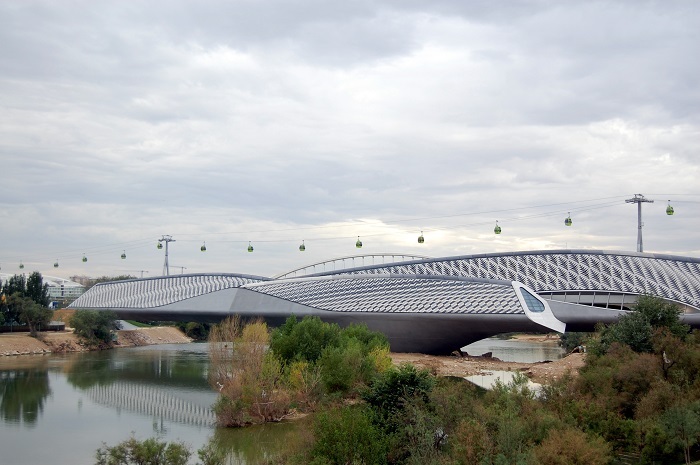 Bridge Pavilion is an enclosed interactive space spanning the Ebro River to form a gateway to the Zaragoza Expo, located in the city of Zaragoza in Spain. 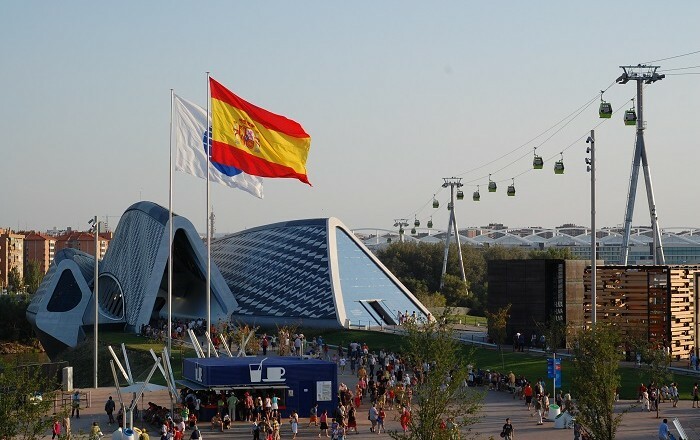 The building is designed by the British-Iraqi architect Zaha Hadid which has designed it for the Expo 2008 in Zaragoza as one of the landmarks for the event. 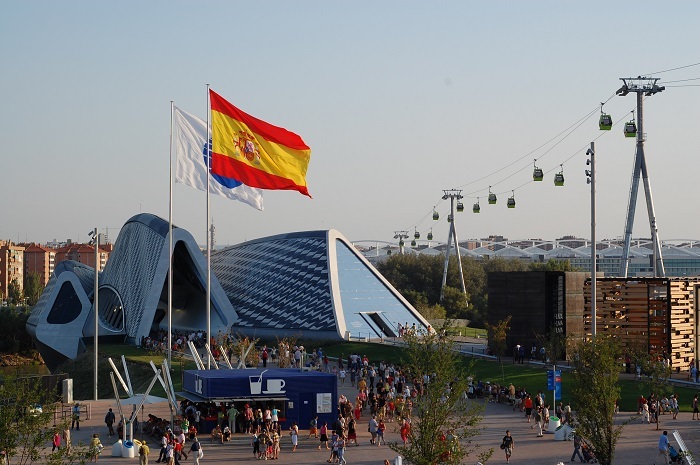 It is a modern and very innovative covered bridge which is 280 meters (919 feet) long, and imitates a gladiola flower over the Ebro River. 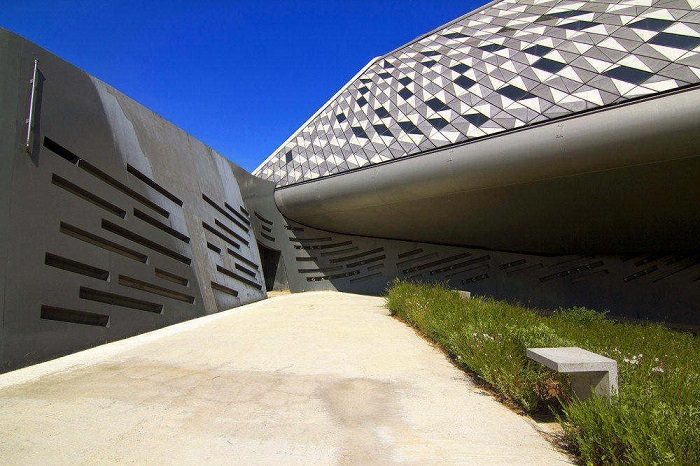 Four structural elements correspond to specific spatial enclosures, which intersect and brace each other, out of which “Water and Sustainbale Development” are the key interprets from the expo’s theme. 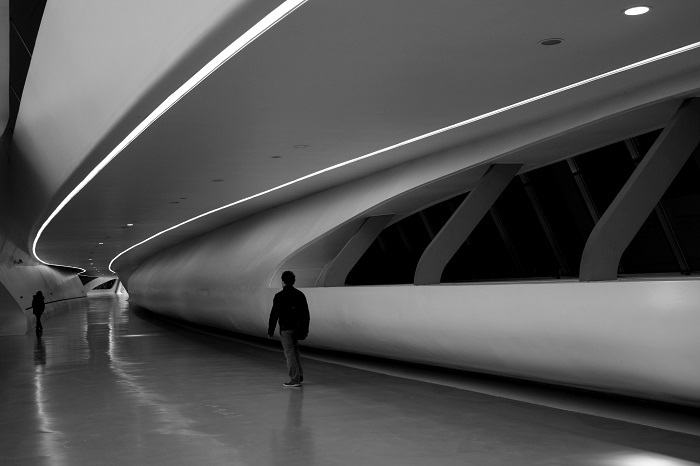 The construction material of the pavilion is Glass Fibre Reinforced Concrete, where the pavilion is covered with fibre glass (fibreC) that has different shades of grey. 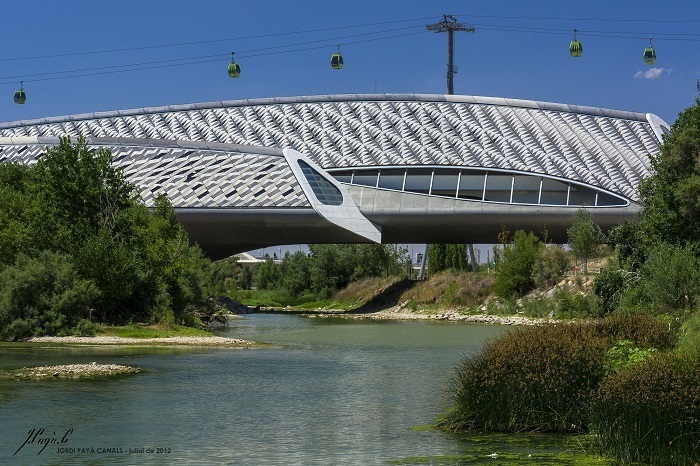 The ultra-modern structure was built using an interlocking diamond-shaped system that connects three elongated steel “pods” that run diagonally across the shores of the Ebro River. 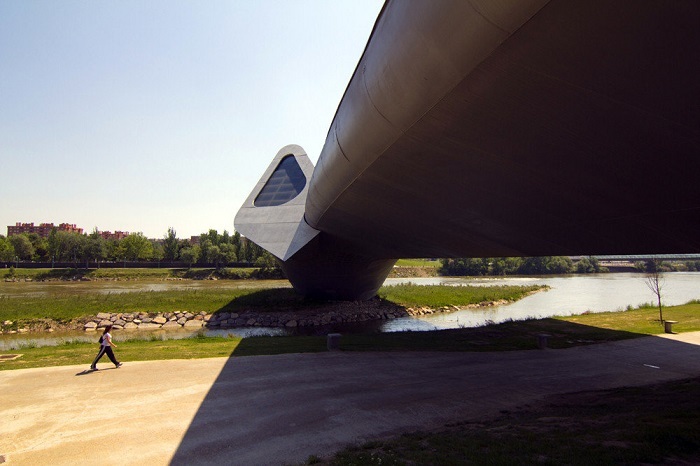 The center of the bridge rests on a small island in the middle of the river. 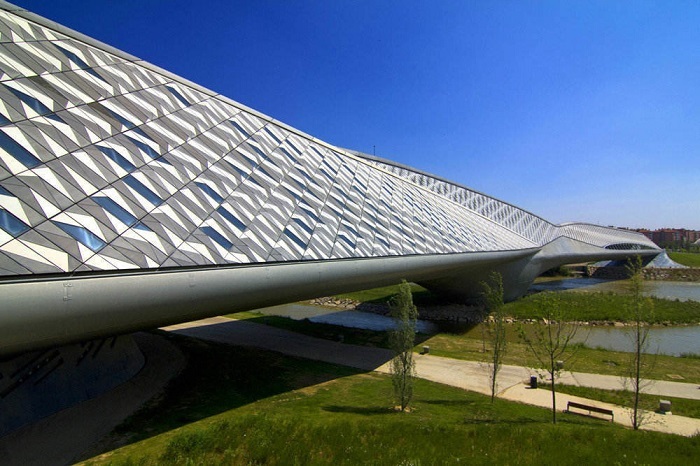 The result is a shark-skin façade that shimmers as it reflects the ever present Spanish sunshine and the water below. 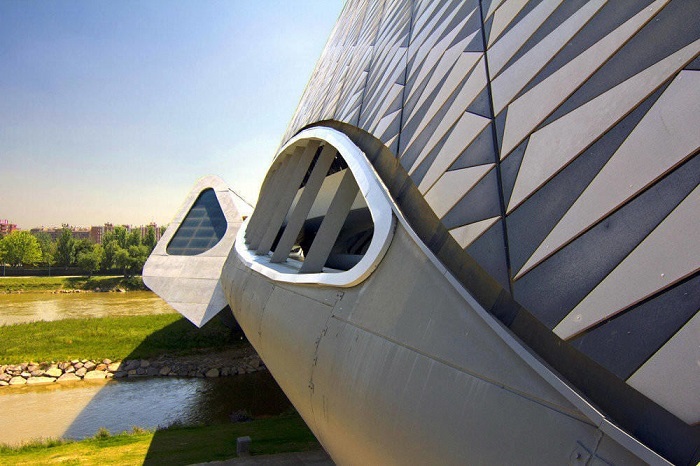 Some of the shingles rotate around a pivot, which allows for natural airflow and temperature control inside the exhibition spaces as well as interior light control. 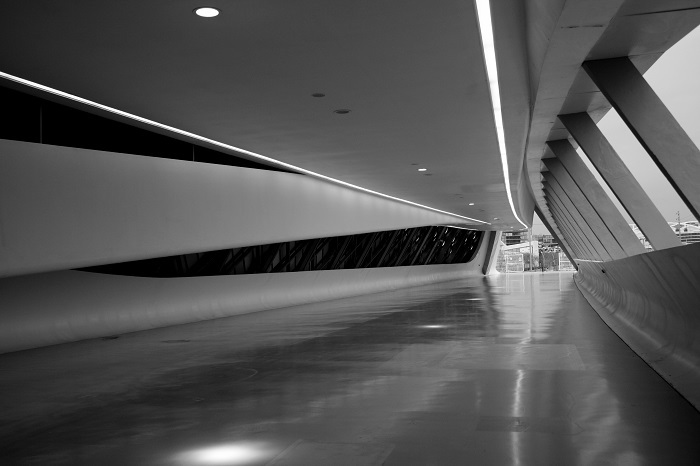 This futuristic masterpiece by Hadid, is making her as one of the ultra-modern architects who have designed something surreal.